As we approach the winter months utility bills become a hot topic for many households in the UK. We are all about to start using our heating more, lights will be going on earlier and when factored into council tax and water charges it can quickly add up and stretch our monthly budget. In this short article we’ll see what Brits are struggling to pay most through our handy infographic below, and also what we can all do to reduce our bills at a time of year when our financial resources are pushed to their limits. Almost one in ten Brits currently owe £200 or more in water bill arrears. rather shocking when you consider a typical annual water bill is £386, meaning one in ten Brits are over six months in arrears with their water company. 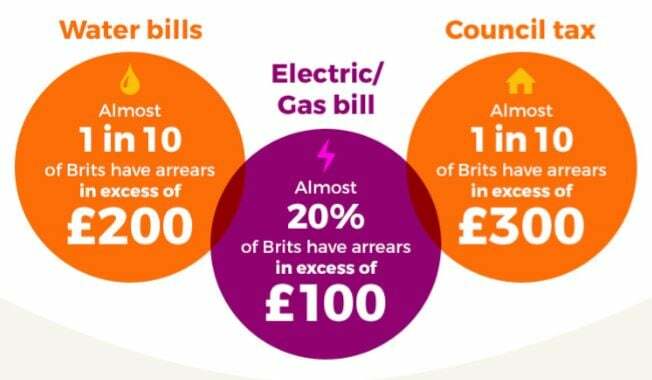 20% of Brits have arrears in excess of £100 on their energy bills and almost one in ten Brits are in arrears to the tune of £300 for their council tax. Hardly surprising then that 25% of those surveyed have ignored a utility bill, with 50% already receiving a late payment notice. But, when we start to borrow to meet payments it can all start to get very messy. 40% of those surveyed admit to having to borrow from friends or family to keep up with payments and another 40% saying they have had to use their overdraft to pay essential bills. It’s a slippery slope that once on, is hard to get off. Yes, the bill is paid. However, it hasn’t really gone anywhere, the creditor has simply changed from your supplier to your lender and there is still another bill to be dealt with the following month. There are better ways to deal with the bill, I’ll explain how. First and foremost speak to your supplier or local council if you’re struggling to keep up with your bills or you have fallen into arrears. They are much more reasonable if you contact them, rather than them having to chase you for payment. Ask if you can arrange a payment plan to pay back the money you owe, but stress what you can afford and don’t overstretch yourself or you’ll just end up back at square one. If, after everything above you’re still struggling to keep up with your payments, it may be worth speaking with your local Citizens Advice Bureau or the Money Advice Service who can help to advise you with your finances. It is better to seek help as quickly as possible to avoid letting matters spiral out of control, there is plenty of help out there so don’t worry. Have you ever struggled to pay your utility bills?